Not all social media teams have a large budget to spend on their Facebook advertising campaigns. And, even if you do, there’s always room to save money and boost ROI. I sat down with three members of Hootsuite’s social media team to find out what they would do—and have done—with just $100 to spend on Facebook ads. After you’ve been given your $100 ad budget, the first thing to do is take a look at your existing social media content. Look at how many comments, likes, link clicks, or views within 24 hours (if it’s a video) your content has earned organically. If something is resonating, there’s a good chance it’ll do well as an ad. Once you establish your top-performing post, you can Boost it instead of creating a net new ad. Facebook’s Boost Post feature allows you to easily turn any post from your Facebook business Page into an ad. You can customize your budget, audience, placement, and posting schedule to get the most out of your campaign—and make every dollar count. With such a limited budget, you want to make sure you are targeting the best audience for your brand. “Be realistic when it comes to your audience. Research thoroughly so you can be as precise as possible. With a budget this size, don’t waste your money on trying to reach people globally. For optimal results, localize your targeting to smaller geographic regions and reign it in,” says social engagement coordinator Nick Martin. A fundamental part of audience research is finding out how people interact with your brand on Facebook. “Keep an eye on the type of device you are seeing the most conversions on. At Hootsuite, we saw the majority of our conversions were coming from mobile users. So, to boost efficiency and ROI, we don’t target desktop users with smaller campaigns,” Hootsuite social marketing coordinator Christine Colling explains. Build a custom audience and retarget users who have already visited your website or signed up for your email list. If they’ve already sought out your business, there’s a better chance they’ll convert. Create a lookalike audience based on your existing customers. Facebook will identify common qualities among users and find potential new customers with similar demographic data and behaviors on Facebook. Learn more about creating lookalike audiences here. “Because of the time and money it takes to create and test multiple audiences, you can expect the best ROI on a small budget from a retargeting strategy or lookalike audience,” Wood explains. 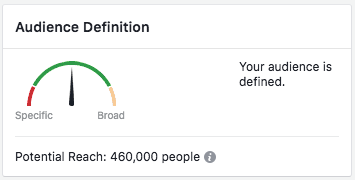 To determine whether your audience is properly defined, pay attention to the gauge in your Facebook Ads manager dashboard. “You want your audience to be like Goldilocks. Not too broad, and not too specific,” Martin explains. With a bit of time and adjustment, you’ll hit that sweet spot—no matter your budget. While building your audience, it’s important to have clear objectives in mind. Define your goals and key performance indicators (KPIs). Then, make sure that all your Facebook ad content is working towards supporting these objectives. Establish your benchmarks, and remember that how another company defines success might be different than your definition. As we explain in our guide to social media ROI it’s important to use metrics that show how social media helps you achieve your objectives. When determining your KPIs, pay attention to the “When You Get Charged” feature under the optimization page before you place your ad. When placing your ad on such a small budget, you need to make sure all components of the content are working towards these objectives. With such a small budget, monitoring your ad performance is crucial. The biggest mistake social ad managers make is forgetting—or not knowing how—to monitor their ads. You want the best return from your ads, so you can’t afford to let a single cent go towards ads that aren’t getting results. While an ad campaign with a bigger budget can afford less meticulous monitoring, our team recommends checking on your ad performance every two hours when you only have $100 to spend. To determine which ads are getting results, our team recommends setting up the Facebook pixel. A Facebook pixel is a code you put on your website that helps you track data and conversions from your Facebook ads. The Hootsuite social team also recommends setting up conversion tracking with UTMs parameters—short text codes added to URLs that track data about website visitors and traffic sources. With UTM codes, you can get deeper insights into which content is working (and which isn’t). This data helps you focus your ad targeting efforts even more—so you can save money and boost performance. Learn more about using UTM Parameters in our tutorial. If you’ve run ads before, you know that testing is another key part of any campaign. 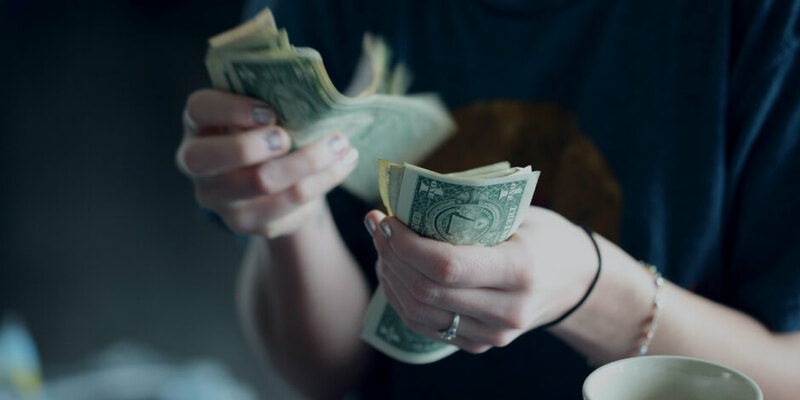 While $100 won’t offer many testing opportunities, our team explains that you can conduct valuable A/B tests by simply raising your budget to $200. Test out different copy, image, and formats (video, static, carousel, etc.) and use the data you collect to build your future ad campaigns. “Use the same image but different messaging or copy to test two different ads, with $100 budget towards each. See which ad gets the best results, shut down the low performer, and then reallocate your budget to the successful ad,” Wood suggests. No matter the size of your budget, making smart decisions is important when it comes to running successful Facebook Ad campaigns.